May | 2012 | God's Abundant Blessings! We often hear from older generations that life used to be so much slower. For example, before the Industrial Revolution people walked instead of drove to get places so they had time together walking, talking and listening. Life on the farm didn’t seem to be such a frantic whirlwind of family activity. A young friend is teaching in Morogoro, Tanzania, and she tells of the slower pace of the culture there. If you meet someone when you are out walking it would be an offense to quickly buzz by them. Time for relationships is more important than deadlines. She has learned that you need to stop and converse with the person, extending hospitality and fellowship. She basically has to plan to have time to rest and “be” with someone on her way to her destination. Today we have technology at our fingertips that connects us to the world. We have drive-up coffee shops and fast food services. Sitting, enjoying, resting and being in the presence of someone is seemingly a fading act. Psalm 23:2 always makes me stop and think. It doesn’t say “I lie down when I feel like it.” It says the Shepherd (God) MAKES me lie down. There’s a part of me that wishes He would do this more often. Slow-me-down’s from God aren’t always fun. Matter-of-fact, I’ve usually experienced them in the form of sickness and trials. So I’m not sure I really want Him to do it that way. But I wish more often I’d wake up fresh at 5:00 in the morning, an hour before my alarm, and be ready to spend time resting with Him. Preciously, this morning is one of those mornings. 5:00 – awake, more awake with a cup of coffee and water splashed in my face. I could curl up in bed and read my book, but I’ve learned that this is precious time from God. Usually, it means that we’ll spend time together and since there is plenty of time before my day actually begins, I’ll be sharing my/His thoughts. And I can get completely absorbed in time with Him. Basking in His presence. Just being in His word and just resting with Him. 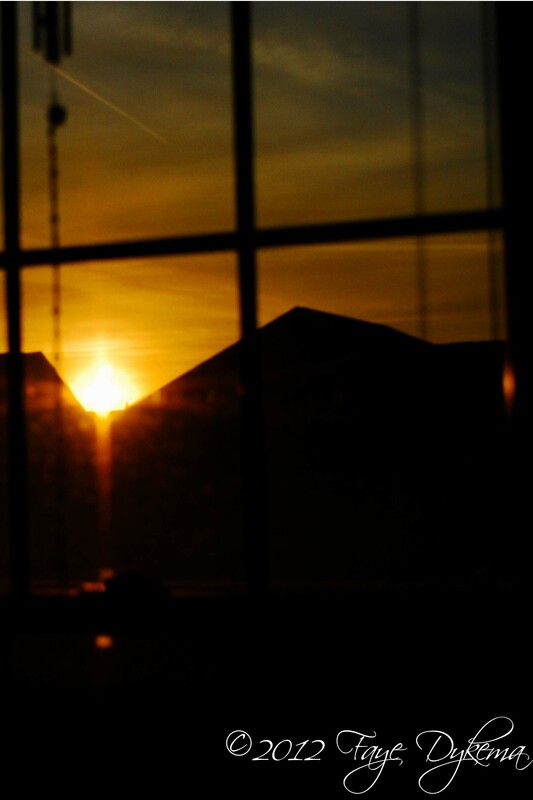 I’m sitting in my office which faces east and watching a beautiful display of colors appear with the sunrise. Sometimes my times where God makes me lie down with Him are early in the morning, grabbing a camera and heading out to watch His wonderful creation once again. Ever changing, always creative, always consistent. I just enjoy BEING in God’s presence. Whether it’s in the beauty of the birds songs, the varieties of greens in the trees, the intricacies of the flowers, or His glorious sunrises, I KNOW I am in the presence of my miraculous, Almighty Lord. James Schaap says, “[God] takes care of me [like sheep]. He makes me lie down in green pastures even when I don’t think of it. He takes care of me even when I don’t ask Him. He shepherds me even when I don’t shepherd myself. … The Lord God Almighty cares for me.” God cares about each one of us enough that He guides, leads, and provides for us quality quiet time with Him. We need to be receptive to His call. I am linked with Good Morning Girls and Beholding Glory. The yield of our life does not depend so much on the number of things that we do, but more on the quality of self-giving that we put to each thing. In order to add this quality, we must depart from this atmosphere of the modern world which is completely obsessed with activism, even in the church: do, do, do always more. Let us rather, once again, become inspired and tranquil men. A recent conversation with a friend reminded me of where I was in my 20s and 30s. I was busy raising a family, starting my own secretarial business and serving God. At least that’s what I was telling myself I was aspiring to. But in reality over the years, I’ve learned that too often I was “doing” church. My husband and I remember our very young son, at the time, in the back seat of the car once asking, “Are we going to church again tonight?” We had been there 3 times for meetings during the week and twice on Sunday. It made us rethink WHY we were involved. Were we looking for the accolades that come with being “committed” to serving God? Were we hoping to “earn a jewel for our crown” by doing one more thing? Were we hoping to appear more holy to God? Were we simply seeing a need and filling it, but quite possibly at the expense of our own spiritual lives? Were we actually enjoying serving God out of grateful hearts? Looking back, I think it was some of each of these. There were Sundays when we showed up to worship God, but were so busy with teaching, leading, or some other task that we missed the opportunity to truly worship and praise God, giving thanks for the blessing He gave us that week. We were too busy “doing” church and not taking the essential time of giving glory to God for ALL He has done for us. Years of reading God’s Word, listening to messages, reading books like The Quest for Serenity and Celebration of Disciplines by Foster have encouraged me to really think why I am “doing” something for God. During a time when my R.A. was really interfering with my lifestyle, I couldn’t “do” much of anything physically. I found myself having a purposeful “slow-me-down” from God. During that time I grew in my relationship with God because I knew my “doing” had to be mostly emotional, mental and spiritual instead of physical. Too often Christians love to be busy for God, but we miss the resting in God. Once we life restfully with God and in God, we will be filled with restful lives. The Westminster Catechism reminds us that “Man’s chief end is” – not personal happiness – “but to glorify God and enjoy Him forever.” Don’t let your lives become so busy DOING that you don’t take time BEING filled with God’s presence. The calm and serenity is really worth it. May God’s peace abide in you. Why does guilt plague me? I feel guilty, not just bad, for not getting more things posted since I started working. At least I did struggle with the guilt feelings until God had another sit-down talk with me. God reminded me that this is His blog, I’m just His tool. He has always given me something to write about that has been a benefit to myself and/or others. So why do I let worry and guilt fester? A minister in the north of England, who oppressed by guilt, had a breakdown, was advised by a wise doctor to concentrate on biblical passages expressing love, mercy, and forgiveness,temporarilyputting aside the ones on condemnation and judgment. The minister followed the doctor’s advice, and he was wonderfully restored. I was waiting on a 20-something lady the other day who was struggling to make her hands work to get the money separated for payment. She was quickly apologizing for the time, and I was blessed to be able to say, “It’s okay. Take your time. I have R.A. and remember what it was like to struggle to pull up the bedsheet with my fingers.” Immediate relief seemd to pour over her face at not being judged or pressured. God’s grace is like that. God isn’t there ready to condemn – He’s ready to pour out His abundant grace on each one of us who believe in Him as Lord and Savior. Paul says in Romans 5:20 – God’s law was given so that all people could see how sinful they were. But as people sinned more and more, God’s wonderful grace became more abundant. 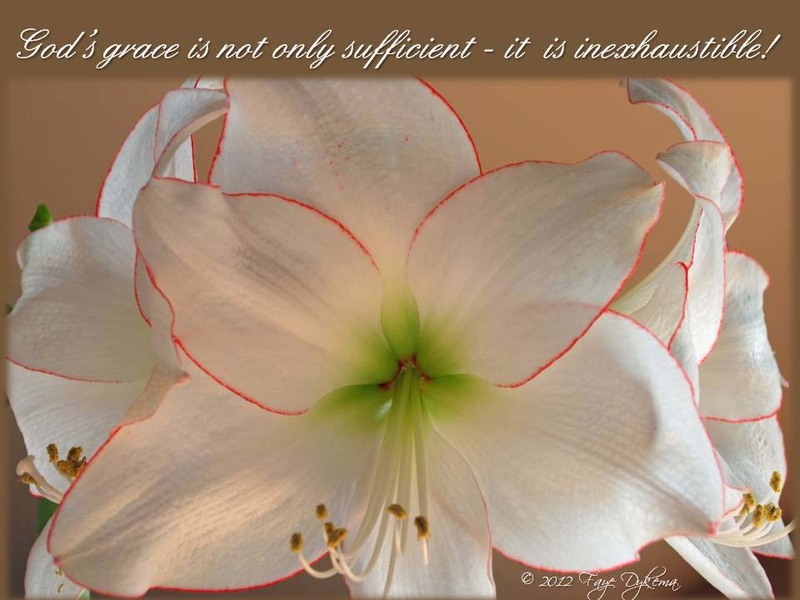 God gives us His grace – abundant, freely given, unconditional, and inexhaustible in supply. Psalm 23 tells of God preparing a table for us in the presence of our enemies. Too often, we are our own worst enemy heaping on guilt and not being filled with God’s grace which in turn brings spiritual rest, peace, serenity and joy. P.S. The incident with the young lady, reminded me of how abundantly God has blessed me – a good rheumatologist, medicines that have given me the ability to work a full day, and the support of family and friends. These are all words that fit the definition of the word “onomatopoeia.” An “onomatopoeia” is defined as a the state or condition of a word formed to imitate the sound of its intended meaning, such as hiss, buzz, murmur, rustle. Over the years when I’ve looked at “Peace,” “Tranquility,” or “Serenity”, I imagine them coming to life as I write them on a page in my sermon notes. P-e-a-c-e just languishes on the tongue and makes one desire quiet calm. Se-ren-i-ty is a flowing, long, drawn-out word that when pronounced that way just brings a harmony to one’s world. Tr-a–n-qui-l-i-ty, likewise, lends itself to a feeling of restfulness and stillness. I visualize these words as scripty, flowing from a pen and off the tongue. We can’t be filled with the peace – serenity – tranquility that comes from God unless we hand over our worries and fears to Him. Do you have a loved one who isn’t saved? Surrender them over to God in prayer. It’s not your battle to save them. It is God’s. God requires you to love them with the unconditional love of God. You are radiate Christ’s life to everyone. When you find yourself really loving someone through God’s eyes, you are filled with a serenity that comes from knowing God is in control and you have surrendered your will to His. Are you frustrated with a body that isn’t working as well as it used to? Remember that you are uniquely made. Jesus knows what you are going through and more. 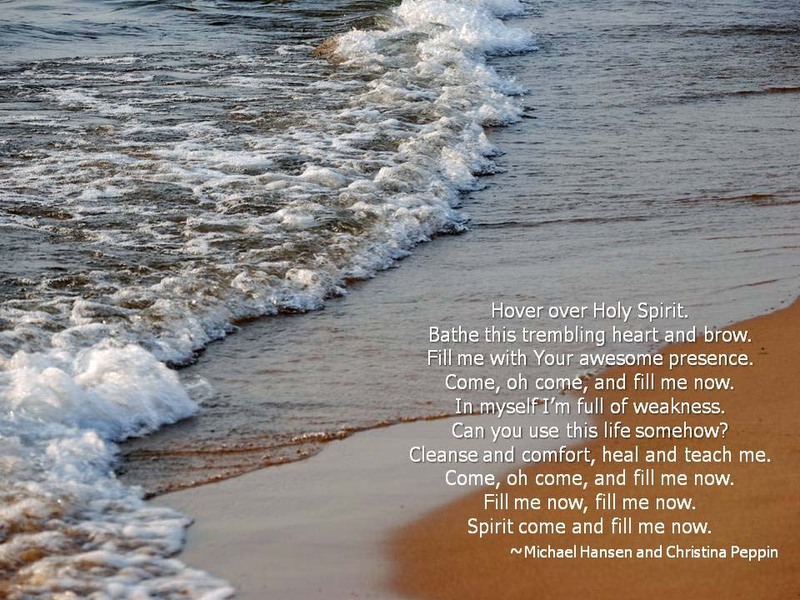 Pour out your heart to Him and be filled with a tranquility that only comes from the Holy Spirit bringing you peace. G.H. 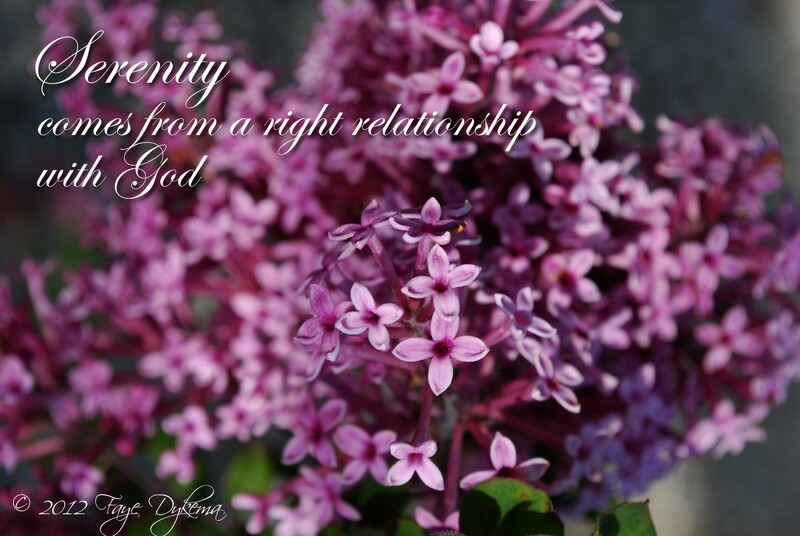 Morling says, “It is much that God the Father is above me; it is more that God the Son is for me; it is still more that God the Holy Spirit is within me.” When we live with this focus, we will be filled with the blessings of peace ~ serenity ~ tranquility from God.